Learn how to implement videos on your page. You can either use a video that someone else has posted on YouTube, and Vimeo, or you can create an account for your site and post all the videos you plan on using to a single place. 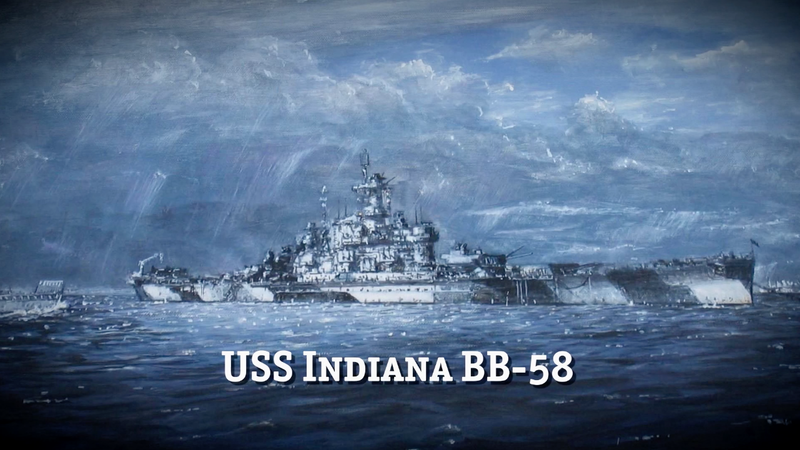 This is a YouTube video displayed in the 50/50 column layout. YouTube - The most popular video hosting site, YouTube offers free hosting. Vimeo - While not as popular as YouTube, Vimeo offers free hosting in HD. HTML5 - While not recommended, HTML5 offers a solution for those who do not have or want a free hosting website account. This is a YouTube video in the 100% breakout column layout. This is the link to the video when you're viewing it in your web browser. 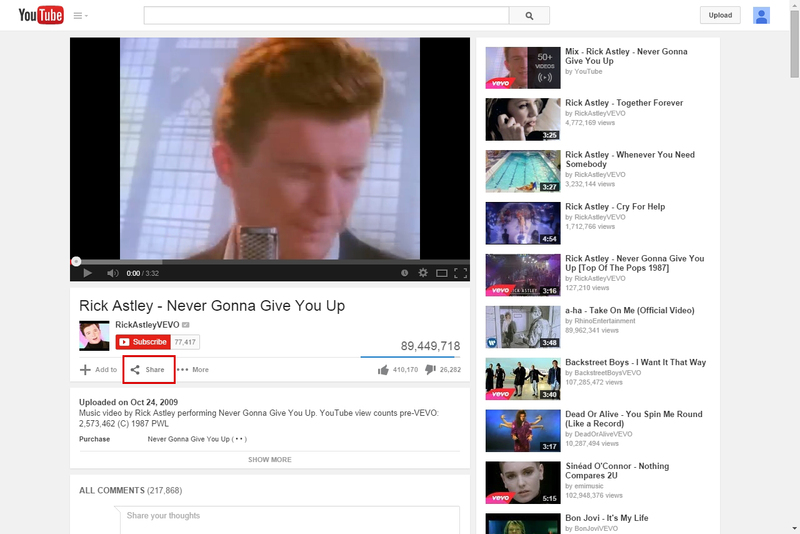 That's the only information the content management system needs from YouTube; everything else happens automatically. You can add a caption to the video to give it context. It uses a WYSIWYG editor, so it supports links, bullets, and other styling. Step 1: Navigate to the video on YouTube.com, then click the Share button. Step 2: Right-click the highlighted URL, then select Copy from the menu. 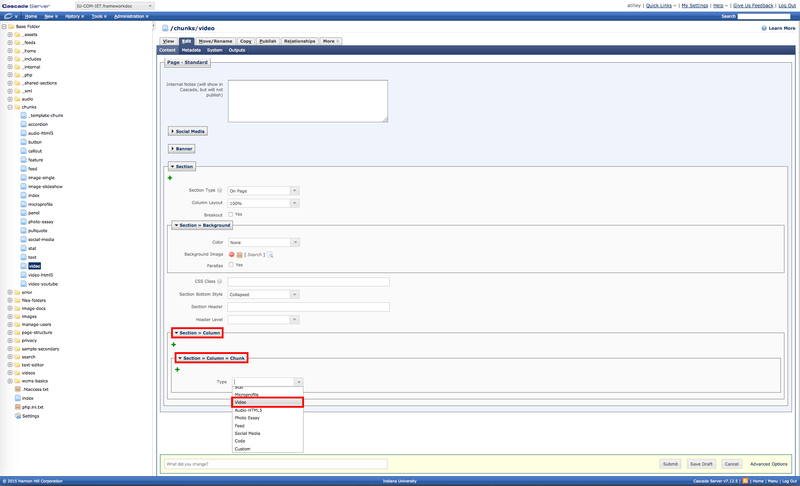 Step 3: Navigate to the WCMS page where the video needs to be placed. Step 4: Expand the section tab where the video will be placed. Choose the appropriate column layout. 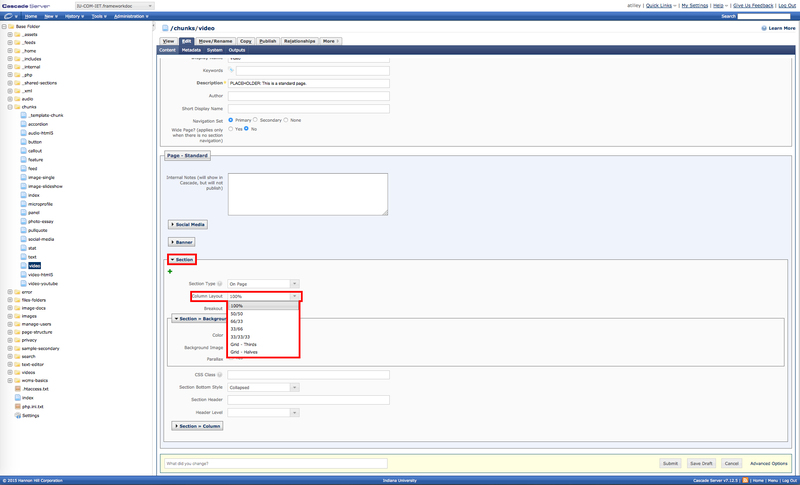 Step 5: Expand the Section >> Column >> Chunk tab, and in the "Type" drop down menu, choose the "Video" option. 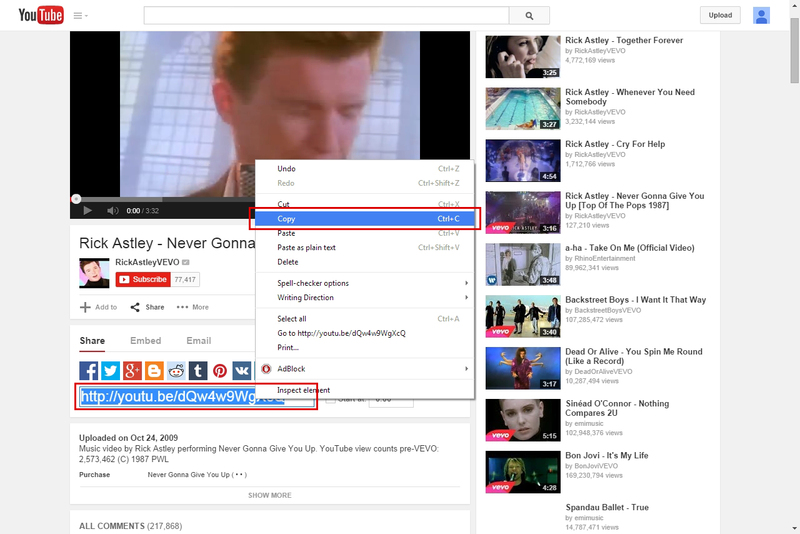 Step 6: Choose YouTube from the Video Type drop down menu, then enter the URL for the video in the URL field. *Note: When using this particular function in the WCMS to display YouTube videos, please do not use special embed URLs. Step 7: A caption may be added in the Caption box. Step 8: Click submit and don't forget to publish. This is a Vimeo video in 100% breakout column layout. This is the link to the video when you're viewing it in your web browser. That's the only information the content management system needs from Vimeo; everything else happens automatically. Step 1: Navigate to the WCMS page where the video needs to be placed. Step 2: Expand the section tab where the video will be placed. Choose the appropriate column layout. Step 3: Expand the Section >> Column >> Chunk tab, and in the "Type" drop down menu, choose the "Video" option. Step 4: Choose Vimeo from the Video Type drop down menu, then enter the URL for the video in the URL field. *Note: When using the WCMS to display Vimeo videos, please do not use special embed URLs, just view the video being placed on Vimeo, copy the URL in the location bar at the top of the browser, and paste it into the URL field in the WCMS. Step 5: A caption may be added in the Caption Box. Step 6: Click submit and don’t forget to publish. This is an HTML5 video in a breakout column chunk. This is what appears when the video is not playing. This is the video file in .mp4 format. This is the same video in a different file format. This allows you to describe the video. It uses a WYSIWYG editor, so you can include links, bullets, and other text styling. HTML5 video is more complicated to include on pages than YouTube or Vimeo. This procedure is included, however it is highly recommend that a YouTube or Vimeo account be created that is associated with the website and uploading videos there instead. Step 4: Choose HTML 5 from the Video Type drop down menu. 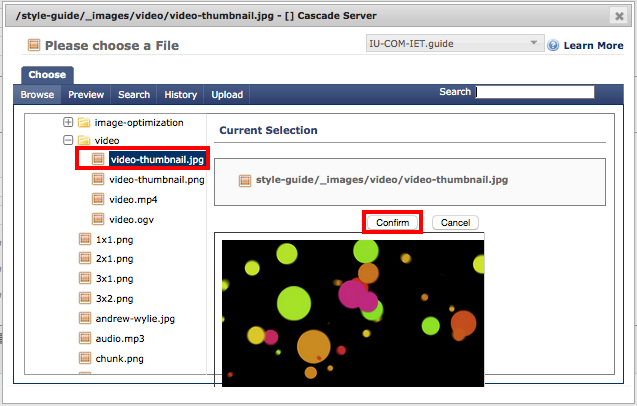 Step 5: Select a thumbnail image by clicking the Browse button next to Thumbnail. Step 6: Navigate to and select an image from the left, then click Confirm. 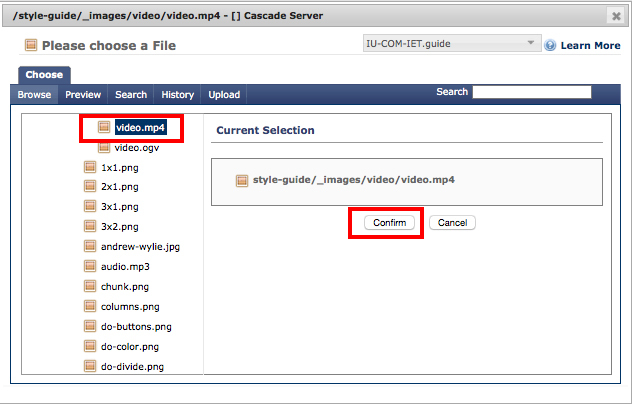 Step 7: Select an MP4 video file by clicking the Browse button next to mp4 - h.264. Step 8: Navigate to and select the MP4 video from the left, then click Confirm. Step 9: Select an OGV video file, click the Browse button next to ogg vorbis. Step 10: Navigate to and select the OGV video file from the left, then click Confirm. Step 11: A caption may be added in the Caption Box. Step 12: Click submit and don’t forget to publish.